PT Jasamarga Properti - Jasamarga Properti or PT JP is a rapid growing company in Indonesia, running business in the field of property business development especially in toll road area. Its business include development, trading, and property-related services. 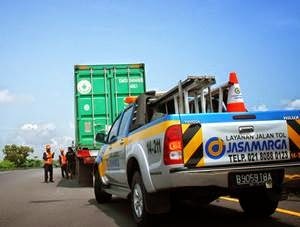 Jasamarga Properti is a member of state-owned toll road operator PT Jasa Marga (Persero) Tbk or Jasamarga Group. According to PT Jasa Marga (Persero) Tbk Annual Report 2016 as cited by JobsCDC.com, PT Jasamarga Properti was formed on 15 February 2013 to support non-toll road business of PT Jasa Marga (Persero) Tbk. PT Jasamarga Properti is 99.8% owned by Jasamarga Gruop and 0.2% by Inkopar Jasamarga. PT Jasamarga Properti is based in Jakarta and its head office is registered at Plaza Tol Taman Mini Indonesia Indah - Jl Jasa Marga RT 008/002 Kel Dukuh, Kec Kramat Jati Jakarta Timur. Male or Female are welcome with age is between 20 – 32 year old. Preferably domiciled at Jabodetabek, Solo, Ngawi, Madiun, Pandaan. Male or Female are welcome with age is between 21 – 30 year old. JobsCDC.com now available on android device. Download now on Google Play here. Please be aware of recruitment fraud. The entire stage of this selection process is free of charge. PT Jasamarga Properti - Admin, Marketing, Site Manager Jasamarga Group August 2017 will never ask for fees or upfront payments for any purposes during the recruitment process such as transportation and accommodation.